Blue PVC Glue | Pool-Tite Wet PVC Glue | FlexPVC® PoolTite LOW VOC PVC Blue Glue for wet applications. 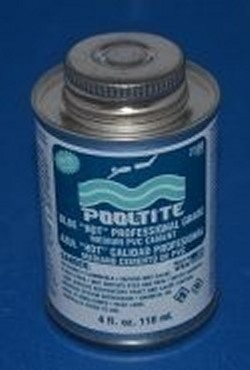 Use PoolTite Medium Bodied Blue Blue for situations where you can't get the pipe perfectly dry. (Works great on dry pipe too). The Pool-Tite wet PVC glue is ideal for pipe up to 6" Sch 40 fittings (and up to 4" Sch 80 fittings). If you are gluing larger pipe, or pipe out of round or pipe with large gouges or any other situation where you don't have perfect fit, you should use HEAVY BODIED cements, which are near the bottom of this page. You should always use Primer/Cleaner for all your fitting/pipe/joint connections. Discover our selection of PVC pipe primers(purple and clear) for your projects.